We crawled. We dined. We mingled. When I started my search sometime last month for #Kamloops posts on Twitter and came across @DishcrawlKam I was so excited. I said to myself, “wha! 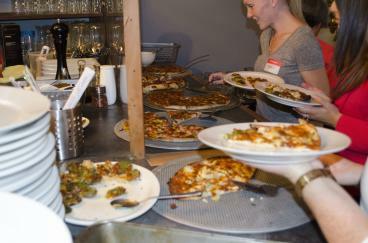 Dishcrawl is coming to Kamloops? !” Needless to say I was happy to be the one given the opportunity to attend this past Wednesday September 18th (even if it was because I was the only one with a free schedule that fine evening) Regardless, I was stoked! Anita Lyapina, who is the Kamloops Dishcrawl Ambassador, is fabulous. As always, being a vegetarian, I was concerned I would not be able to taste everything that was offered; however, she quite easily put my mind at ease by telling me it was no problem at all to accommodate vegetarians and those with other dietary restrictions. To take a step back, if you are not aware of what Dishcrawl is, it’s an evening with a group of other foodies who meet at a secret location disclosed 24 hours prior to the event date. At this meeting spot, you sign in, mingle and taste food. After a set amount of time, you head to the other secret downtown local specialty food spots to get a feel of what Kamloops’ downtown core represents. Each location is a secret until you arrive which really made this fun! First stop – Papa Tees Pizzeria, where we doodled our names on a ‘my name is’ sticker that we all wore – thank you, from someone who could use some work in the name-remembering department. I sat at a table with a fabulous writer Daniella who I must thank for sharing her napkin, and a few ladies from NewGold, who I must also thank for getting up and down a dozen times (note to self, when taking photos, sit on the end of the booth), thanks ladies! Delicious gluten-free artisan pizza, gluten-free bruschetta pizza and mushroom caps stuffed with spinach puree and cheese and bell peppers stuffed with spinach puree and cheese! Second stop. Secret location revealed. Cornerstone Sushi & Korean BBQ. I have to admit, I had not yet up until this point experienced what I’d been missing. 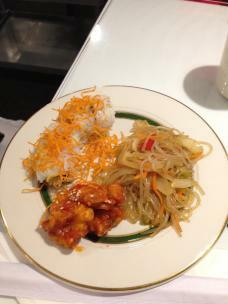 The most delicious tempura yam rolls and sweet potato noodles. My table-sharers also loved the Korean style spicy chicken (as seen below). I’ll be back! Complete with spicy salsa, Tacos El Pastor (minus the chicken) add the avocado and refried beans and guacamole. Num num. 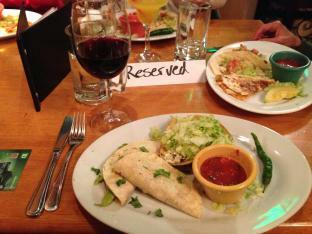 My fellow dish crawlers enjoyed fish tacos and a healthy serving of a ranchera quesadilla. Before we knew it, it was desert time! I like to call it crack filler – no matter how full you are, the dessert just fills in the small cracks left unfilled. The Swiss Pastries & Bakery Café. 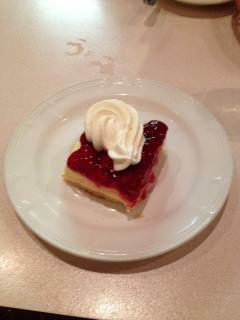 A must eat, Raspberry Torte. They say a picture speaks a thousand words, but take it from the newest ‘Dishcrawler’, to eat this decadent dessert resounds a thousand taste buds requesting more with every bite. Again, a must eat! And so ended my first Dishcrawl. Until the next time, October 30th! I’m already counting down the days…Mmmmm. Get updates on events, things to do, and new attractions.